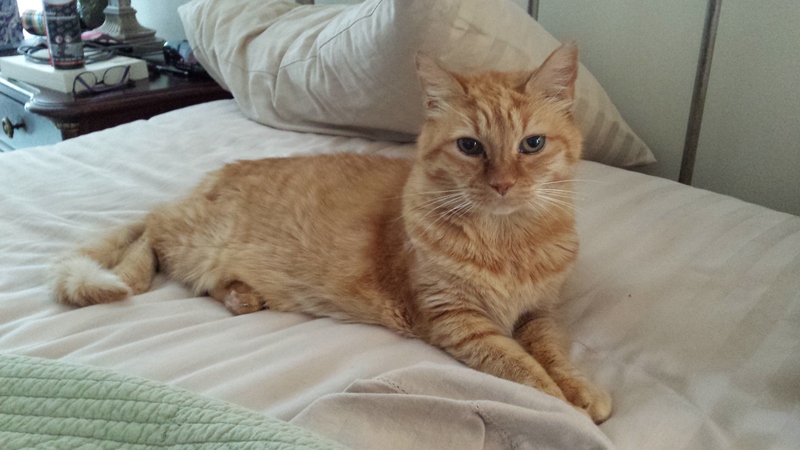 This morning, at about 8:45, our beloved cat Goldie passed away. Only the day before, she was diagnosed with a brain tumor that was affecting her movement and cognitive functions, and she had deteriorated rapidly over the course of the past 4 days. She was scheduled to go into surgery this morning to remove the tumor, but passed away as they were prepping her for the surgery. Often the most beloved pets are the ones that you never planned for. Two years ago, we were fostering for a rescue group in our area, and a rescue group further north called to say that they had a pregnant cat that they needed help with. We’ve had experience with such situations before, so we volunteered to help, and went and met the lady with the cat we would name Goldie in the parking lot of a local Starbucks. Goldie was scared, but docile, and Beth held her in her arms for the whole ride home. Goldie, when she first came to us in March of 2013. We quickly learned that we had likely been “conned” by the other rescue group. 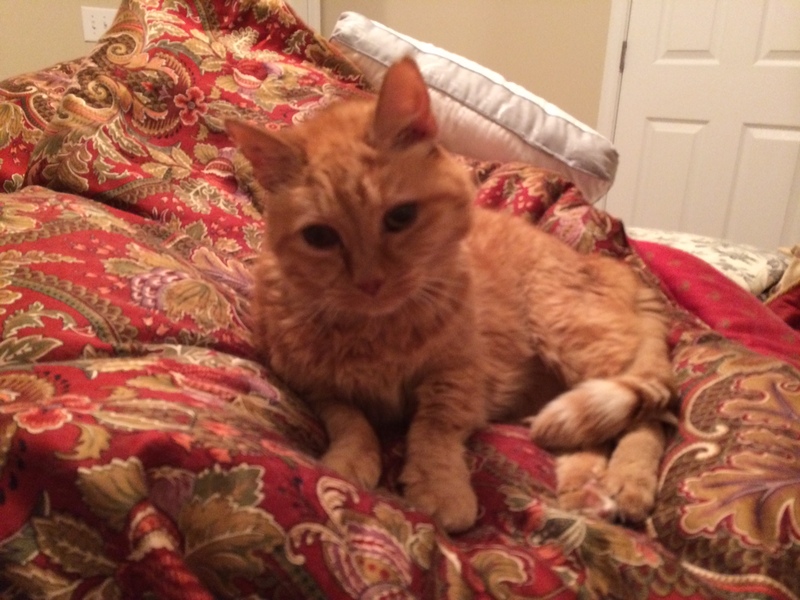 Goldie was not pregnant, or even young: she was an elder cat with severe arthritis in her back legs and was mostly deaf. She was somewhat suspicious of people, and had a history to justify this: an x-ray showed that she had a bb lodged in one of her back legs. We were determined to work with her, however, and try and make her a good adoptee for some family. That family turned out to be us. A couple of breakthroughs in our interactions are worth mentioning. 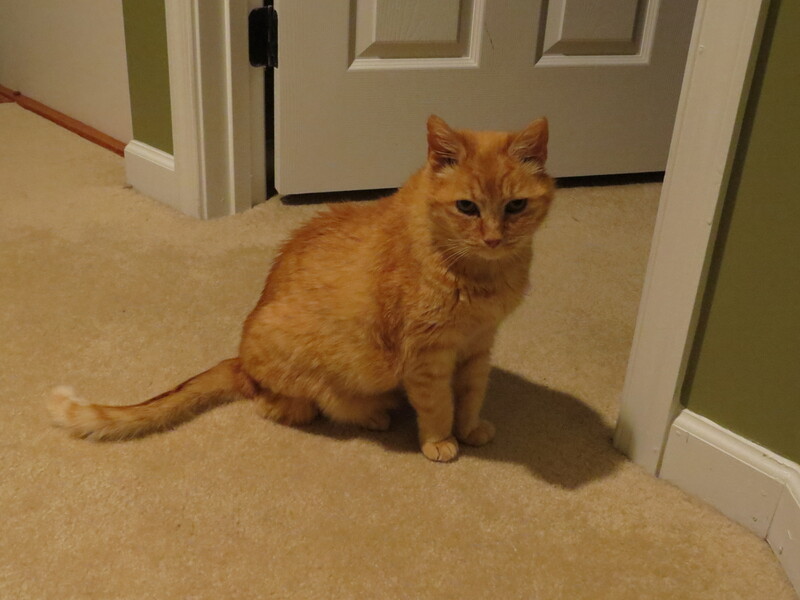 Goldie did not get along with our other cats, particularly Sabrina, so we had her isolated in my game room upstairs. One day I simply went in and played games with her at my side for a few hours, and in that time she seemed to bond closely with me. The other breakthrough I’m particularly proud of. When she first arrived, Goldie was unwilling to have her back touched much at all, probably due to her arthritis. While I was petting her, I got too far down on her back and she dealt me a savage bite, actually drawing blood. Instead of getting mad, though, I just gave her a few moments and then gently started petting her head again. Her trust of us grew immensely after that. Goldie stretching out back in 2013. Goldie had her own ideas about what she wanted, and wasn’t afraid to share those ideas. Just before she came to us, we had purchased a set of pet stairs for one of our other older cats to help her get on the bed at night. I’ll never forget the first night that Goldie climbed the stairs and poked her head up over the edge of the bed, jumped confidently up onto it and trotted over to sleep between us at night. This became her regular routine, and Goldie spent almost every night between our heads. We even got her a kitty bed so that she could curl up more comfortably. She wasn’t shy about demanding things, and had no problem bopping me on the head in order to get more pettings, particularly scritchings of her nose and ears. Beth often joked that Goldie was particularly in love with me but, when Beth went out of town, Goldie would look for her, too. Goldie ready for bed, December 2013. 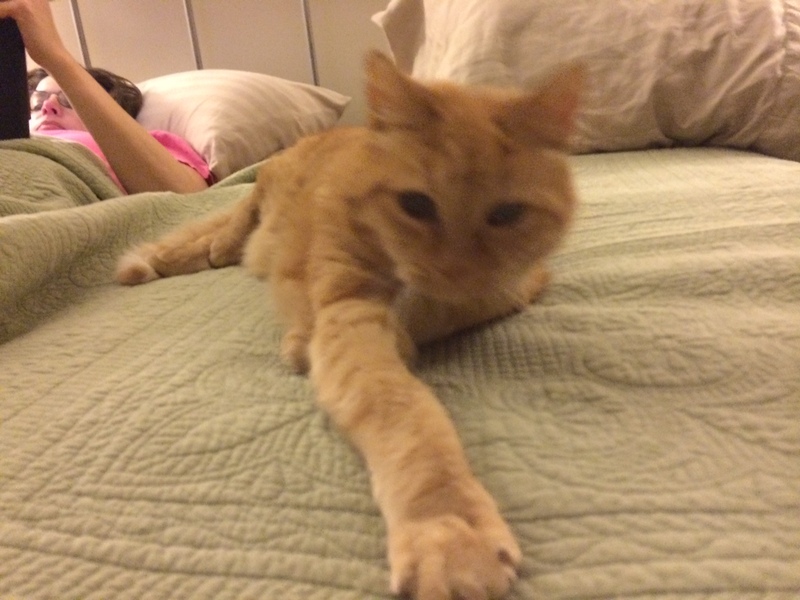 Goldie had the most delightful purr! She was hard to get started, but when she did, she would first emit a series of pre-purr meows, just little chirps, like her motor was just warming up. Even though she was mostly deaf, Goldie was also quite vocal. During the day, Goldie stayed in the guest bedroom, as she wasn’t particularly fond of the other cats and our cat Sabrina in particular decided that Goldie was her nemesis. Goldie was fine with this arrangement, and would sit on the bed and look out the window or nap in a bed on the floor, and we would check on her during the day and feed her. After her nighttime feeding, though, she would yell at us to let us know that she was ready for bed, and when we opened the door she would trot out and dutifully march up the steps to her spot between us. She would often wake me up early in the morning to let me know that she was tired of us and ready to go back to her room again! Goldie reaching out for me, February 2014. 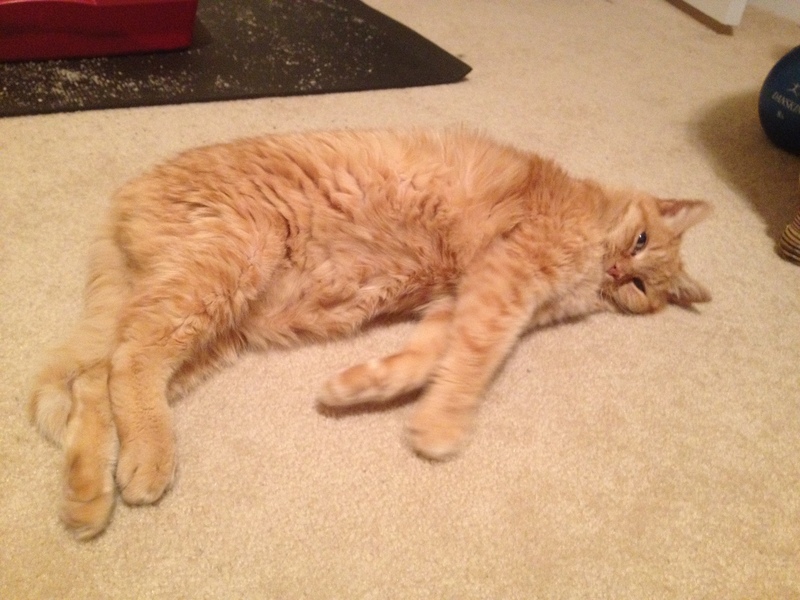 Goldie wasn’t much of a play cat, as her arthritis made it hard for her to move around. She had some fun with the laser pointer, though, and loved a good catnip tail. 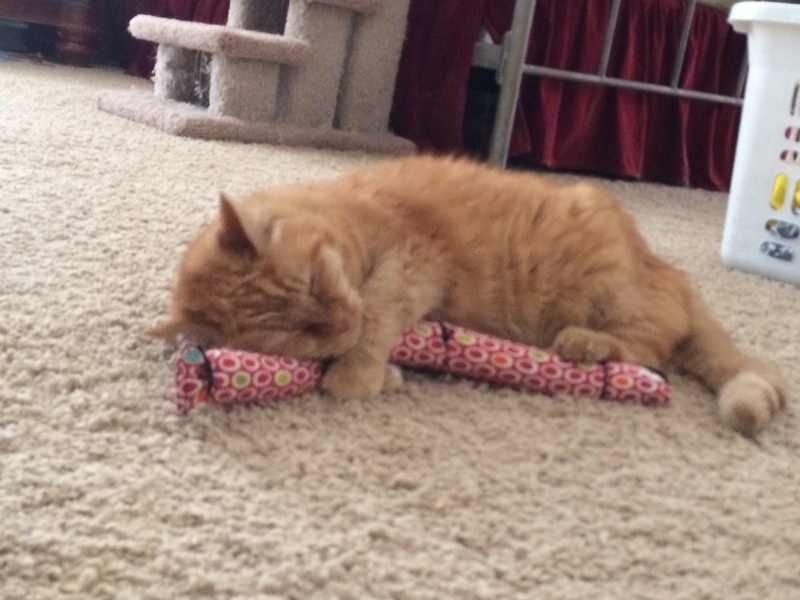 Goldie enjoys a catnip tail, July 2014. She was a lovely, loving, beautiful cat, and Beth and I feel truly grateful, even honored, that we could spend the time we had with her. We gave her a happy home where she could live out her older years in peace. She loved us, and we loved her, and she knew that she was loved. 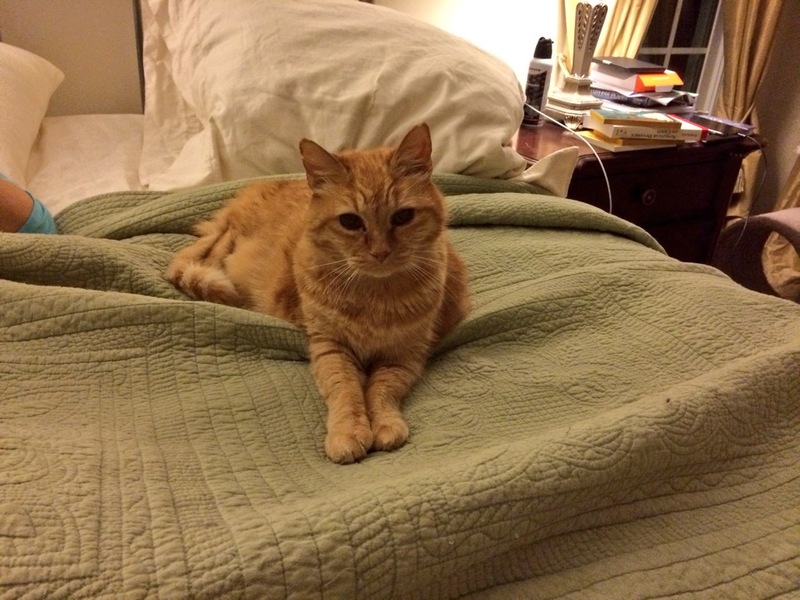 One small postscript: It occurred to me that, in spite of everything, Goldie remained a foster kitty through her life with us. I just made a donation to SOS Feline Rescue, with whom we fostered her, equal to the usual adoption fee for pets. Not only will this action help other cats out there, but it is my way of making it official that Goldie was, in fact, a member of our family. This entry was posted in Animals, Personal. Bookmark the permalink. What a gorgeous girl. Her mind will be at ease now. RIP Goldie. What a beautiful girl. I am glad she was able to spend her final years with your family. It is so hard to lose a pet, my thoughts are with you all. Rest in peace lovely Goldie.